In this tutorial, we will show you how to install the latest Moodle manually on Windows Server hosting environment with Plesk Control panel and will show you the error during the installation. Hope this tutorial will help you. 1. Download the latest Moodle version directly on their site https://download.moodle.org/releases/latest/. Just download it to your computer. 2. Login to your Plesk Control Panel and add MySQL database. 3. 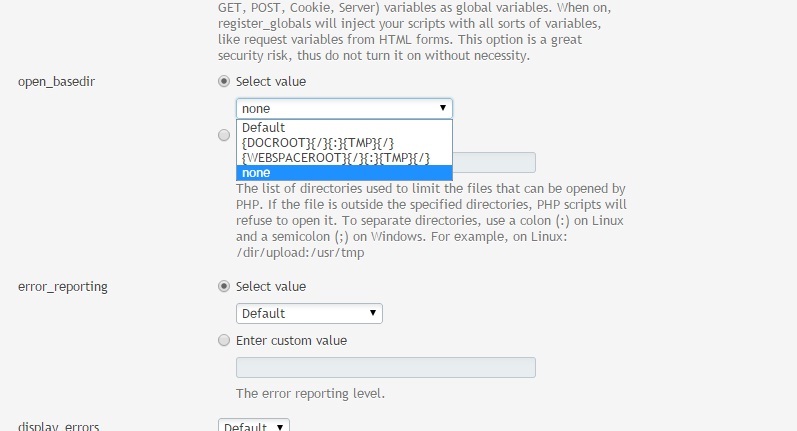 Extract the Moodle file to your root folder. 6. Browse your site again. It will ask the Moodle installation. "Parent directory (C:\ClientSites\MyDomain.com) is not writeable. 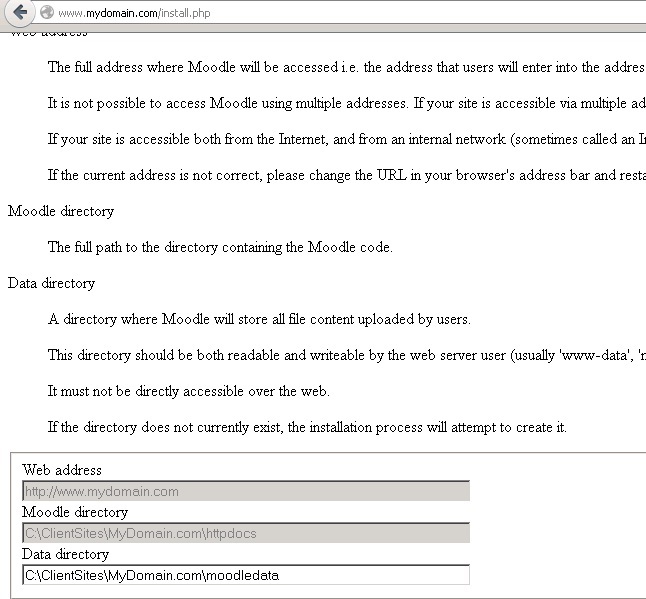 Data directory (C:\ClientSites\MyDomain.com\moodledata) cannot be created by the installer." Then, please give full permission again to C:\ClientSites\MyDomain folder. Once, you have given the permission, then you can continue the installation. 8. Once you click Next, it will ask the database server that you want to use. In this case, we use MySQL server so we select MySQL. 9. 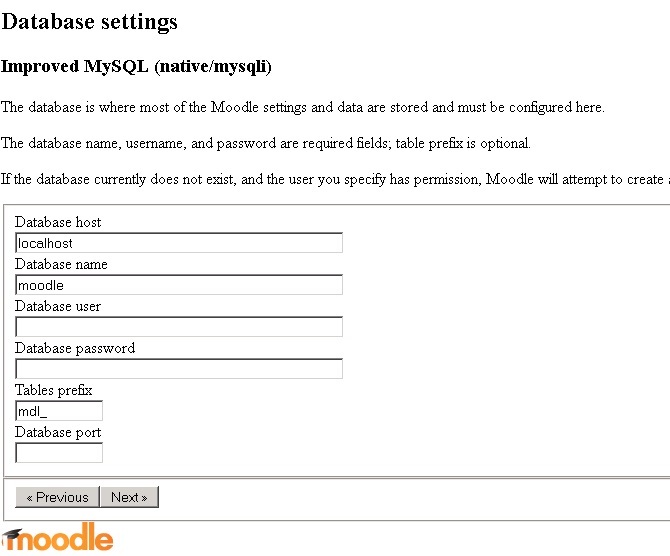 Once you click Next, Moodle requires your database details. Please make sure you fill the correct details so you can continue the installation. 11. Once you have refreshed it, you won’t see this error message again. You will be asked about language that you want to use. This is the last error that you might find during the installation. If you can fix this issue, then the Moodle is ready. This issue is about the timeout error, so we need to increase PHP activity timeout on the server. When your PHP script runs longer than 10 minutes (600 seconds) you will get an 500 Internal server error. To fix this issue you will need to increase the fastCgi activityTimeout in IIS7. C:\Windows\System32\inetsrv>appcmd set config -section:system.webServer/fastCgi "-[fullPath='C:\Program Files (x86)\PHP\v5.4\php-cgi.exe'].activityTimeout:3600"
Not the use of double and single quotes to specify the correct parameters. Applied configuration changes to section "system.webServer/fastCgi" for "MACHINE/WEBROOT/APPHOST" at configuration commit path "MACHINE/WEBROOT/APPHOST"
As you can see the activityTimeout is now increased. 5. Restart your IIS service and your good to go. I hope article above help you to install Moodle. Please feel free to share this tutorial if you find this is useful. Thank you for reading this tutorial. The problem lies using the request_path key upon the $product model, that the Mage_Catalog_Model_Product_Url : : getUrl () sets, to become a cached worth for an otherwise intensive method of resolving a URL rewrite to an item inside a category. Note which any technique outlined in the top of the card that leads to the category to be present inside the returned URL can have a similar effect of caching the category. HostForLIFE.eu, a leading Windows web hosting provider with innovative technology solutions and a dedicated professional services team proudly announces New Data Center in Paris (France) for all costumers. HostForLIFE’s new data center in Paris will address strong demand from customers for excellent data center services in Europe, as data consumption and hosting services experience continued growth in the global IT markets. The new facility will provide customers and our end users with HostForLIFE.eu services that meet in-country data residency requirements. It will also complement the existing HostForLIFE.eu. The Paris (France) data center will offer the full range of HostForLIFE.eu web hosting infrastructure services, including bare metal servers, virtual servers, storage and networking. HostForLIFE.eu expansion into Paris gives us a stronger European market presence as well as added proximity and access to HostForLIFE.eu growing customer base in region. HostForLIFE.eu has been a leader in the dedicated Windows & ASP.NET Hosting industry for a number of years now and we are looking forward to bringing our level of service and reliability to the Windows market at an affordable price. The new data center will allow customers to replicate or integrate data between Paris data centers with high transfer speeds and unmetered bandwidth (at no charge) between facilities. Paris itself, is a major center of business with a third of the world’s largest companies headquartered there, but it also boasts a large community of emerging technology startups, incubators, and entrepreneurs. Our network is built from best-in-class networking infrastructure, hardware, and software with exceptional bandwidth and connectivity for the highest speed and reliability. Every upstream network port is multiple 10G and every rack is terminated with two 10G connections to the public Internet and two 10G connections to our private network. Every location is hardened against physical intrusion, and server room access is limited to certified employees. All of HostForLIFE.eu controls (inside and outside the data center) are vetted by third-party auditors, and we provide detailed reports for our customers own security certifications. The most sensitive financial, healthcare, and government workloads require the unparalleled protection HostForLIFE.eu provides. Paris data centres meet the highest levels of building security, including constant security by trained security staff 24x7, electronic access management, proximity access control systems and CCTV. HostForLIFE.eu is monitored 24/7 by 441 cameras onsite. All customers are offered a 24/7 support function and access to our IT equipment at any time 24/7 by 365 days a year. AspEncrypt is an Active Server component that brings security to your applications through encryption. With AspEncrypt, you can encrypt data, send S/MIME-based secure mail, compute one-way hash values, generate and verify digital signatures, issue and manage X.509 digital certificates, and more. This component can be used in an ASP/ASP.NET or VB environment on Windows 2000/XP/2003/2008/Vista/7.In this article we will tell you about “How to Use AspEncrypt as a Client-site ActiveX Control”. Starting with Version 2.0, the AspEncrypt.dll file contains an ActiveX control component called XEncrypt which can be used on the client side inside Internet Explorer 4.0+. All the cryptographic operations offered by AspEncrypt can now take place on the user’s machine and not just the web server. XEncrypt exposes the same properties and methods as CryptoManager with the exception of a few methods not applicable to client-side operations. Most importantly, XEncrypt allows your Web-based application to perform operations involving the user’s private key such as digital signing or data decryption without jeopardizing the security of the private key. XEncrypt does not require a registration key, so you do not need to purchase a license for every client machine XEncrypt will be downloaded to. However, XEncrypt will only work under IE and not any other environment such as VB, etc. For containers other than IE, you must continue using the CryptoManager object which requires a registration key. HostforLIFE.eu was founded in 2008. It has been topping the list of almost all the web hosting review sites so far. Still have websites running on ASP 3.0 or Classic ASP? Don’t worry; we still support legacy technology like Classic ASP Hosting. You can also mix and match Classic ASP and ASP.NET code in one single web site. We will make sure that Classic ASP runs smoothly on our servers and that your website is safer, faster and better supported than anywhere else! Our best and cheap Classic ASP hosting plan is starting at $5.00/mo. HostforLIFE.eu is now providing free domain and double SQL server space for new clients to enjoy the company’s outstanding web hosting service.